"Ilse, a childhood friend of mine, once found a raspberry in the camp and carried it in her pocket all day to present to me that night in a leaf. Imagine a world in which your entire possession is one raspberry and you give it to a friend." 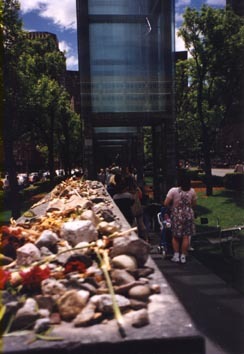 Designed by San Francisco architect Stanley Saitowitz, the New England Holocaust Memorial is located in a small park near Faneuil Hall. Its six luminescent 54 foot high glass towers, are lit from within so they glow at night. Once viewers are within their corridor they see each tower is inscribed with the name of one of the six major Nazi death camps. Smoke rises from floor gratings, which cover sparkling lights in placed objects. Then looking up viewers see the walls of the towers are etched with a sequence of numbers from 0000001 - 6,000,000, remembering the ghastly Nazi practice of tattooing serial numbers on their victims. Six million Jews were killed during the holocaust, as well a 5 million others, Gypsies, Poles, homosexuals and the disabled. As is true of nearly all public art, there was controversy around the memorial. In the early stages it faced opposition from some area Jews who asserted that Boston was not an appropriate place for such a memorial. Once constructed it was broadly accepted, and became a respected site along Boston's Freedom Trail. On April 19th, 2001, Leo V. Felton and Erica Chase were arrested on charges of counterfeiting. Upon searching their apartment, which had a Nazi flag hanging in to window, Boston police discovered bomb making materials and evidence suggesting the pair planned to blow up the New England Holocaust Memorial as part of a plan to start a "racial holy war." The memorial, attributed with stirring reverence of the past, was apparently recognized as having such power that it that extremists would seek its destruction. This tragic, chilling action demonstrates the need to tangibly build such memories in to public spaces and their symbolic importance.